Sponsored content created and provided by Jon Pretz, Ph.D., Dairy Nutritionist at Hubbard Feeds. Trace mineral nutrition and its application in dairy rations continues to receive significant attention through research and its implementation in the field. Historically, nutritionists have supplemented dairy cattle rations with inorganic salts consisting of metals bound via ionic bonds to sulfates or oxides (e.g. copper sulfate, zinc sulfate, zinc oxide, etc.) to prevent mineral deficiencies and to support metabolism, growth and reproduction. As the industry evolves, dairy producers are continually challenged to find ways to increase herd productivity and profitability. Moving forward, one easy way to help maximize herd productivity is to exploit the dairy animal’s genetic potential through the utilization of organic trace minerals. 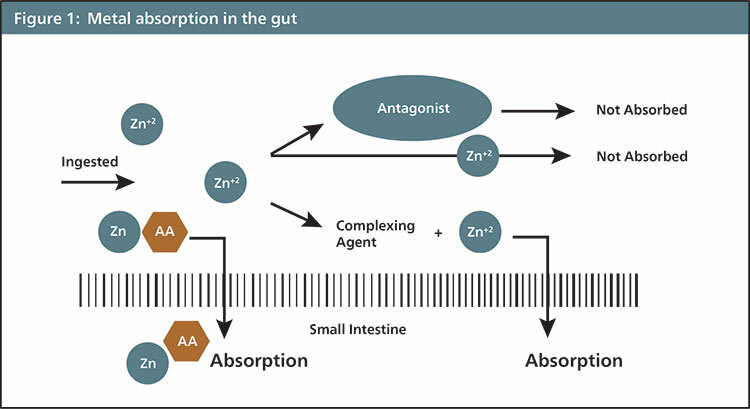 Organic trace minerals consist of these same metals being chelated, complexed or covalently bonded to amino acids, analogues of amino acids, proteins or organic acids in such a way that they tend to be more bioavailable in the intestine (Figure 1). In comparison, when inorganic minerals are supplemented, a portion of them breaks down readily in the rumen before reaching the intestine. This causes these minerals to form indigestible compounds with other feed components, making the initial mineral supplement partially unavailable for absorption and potentially killing beneficial rumen microbes. Produce an economically-beneficial response in the animal. Solubility: High water solubility is a key component of an effective organic trace mineral. Insoluble materials will not be absorbed in significant concentrations and will pass through the digestive tract of the animal. Stability: High-quality organic trace minerals should remain stable throughout the digestion process and should not interact with phytate, fiber, clay and minerals already in the digestive tract, minimizing the risk of antagonists. This same stability trait should also minimize interaction with rumen microflora — which, in turn, helps maintain and promote proper digestion within the animal. Absorption and bioavailability: Improving absorption is the most critical characteristic of an organic trace mineral. The molecular size of the organic trace is key to improving absorption. The smaller the organic mineral carrier, the more easily absorbed the mineral will be, as long as the carrier forms a very strong bond with the trace mineral. Typically, an amino acid is used as the carrier and forms a very strong bond with the metal, protecting it from antagonists as it moves through the digestive system, thus improving absorption. Bioavailability is defined as the percentage of total nutrient in a feed ingredient that is actually utilized by the animal. Bioavailability is extremely tough to measure outside of controlled research trials. However, numerous university research trials have determined that organic trace minerals are much more bioavailable to the animal than inorganic trace minerals. Economically-beneficial response: Through performance increases in milk yield and reproduction, decreased somatic cell count and improved hoof health, we can comfortably predict results beyond a 2:1 return on investment. Furthermore, we can expect our animals to more easily reach their genetic potential while minimizing the trace mineral excretion that will end up back on fields. Hubbard offers a range of trace minerals that provide mineral nutrition in a form as close to nature as possible. Bioplex minerals are trace minerals that are bound to amino acids and a range of peptides. They are easily absorbed and readily metabolized, optimizing animal performance. Bioplex trace minerals (zinc, manganese, copper, iron and cobalt) are co-factors in enzymes critical to the animal’s defense system, growth and reproduction. Feeding dairy animals diets that contain more available sources of trace minerals, such as those provided by Bioplex, is a key way to increase mineral availability for absorption and, ultimately, to improve trace mineral status in the animal. It is important to note that responses to organic trace mineral nutrition are likely to be subtle improvements in health, performance and reproduction. Cope, C., et al. 2009. Effects of level and form of dietary zinc on dairy cow performance and health. J. Dairy Sci. 92:2128-2135. Kinal, S., et al. 2007, The effectiveness of zinc, copper and manganese applied in organic forms in diets of high milk yielding cows. J. of Food, Ag & Envi. Vol.5(2):189-193.